I've been using centers for several years now, and have really enjoyed the student-centered learning environment and the chance to work with students one-on-one. 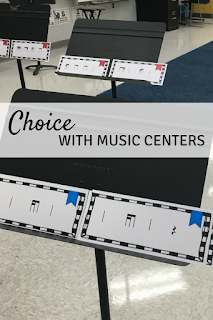 In today's post, I'm writing about something new I've been trying: giving students choice during centers! So why give students choice during centers? In my experience, students really love the ability to choose what they do, when. 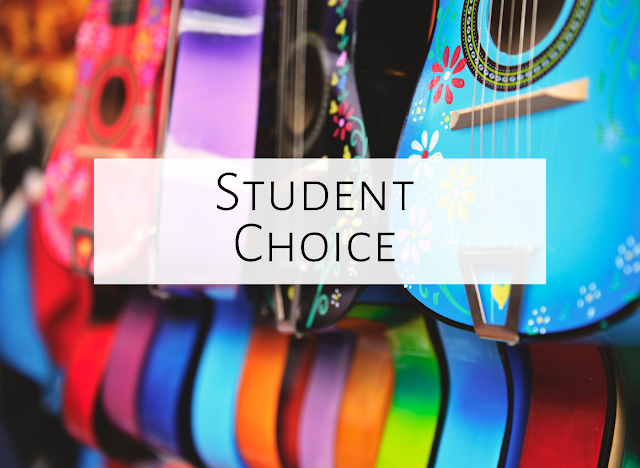 In fact, just this week, after I told the students they get to choose, I had a student look at me incredulously and exclaim, "We get to choose?!?! That's COOL!" Typically, when I do centers and am not having students choose, I have 4 centers spread out around the room, and I tell them who's in their group, and when they switch (usually every 5 or so minutes.) Because students get to choose in this scenario, I use 6 centers, so there's more from which to choose. 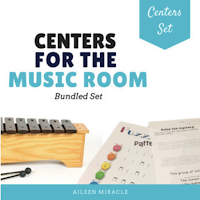 I spread out those 6 centers around the room, explain each center, then tell students they can go to whichever center they want, and can switch whenever they want. Yes! I tell students that they have to go to at least 3 of the centers. About halfway through the class, I'll play the wind chimes (so students know to get quiet) and remind students that if they have only visited one center, they need to rotate soon. If I notice that a student is not on task at a center--especially after a reminder--then I tell that student that he/she is done with that center and has to visit another. I sometimes also tell students who are not making good choices together that they have to separate. I let kids know ahead of time that if there are lots of kids at one center, they should go to another center until it thins out a bit, especially if there are not enough materials at that center. Here are six centers you could use to practice ta and ti-ti, with students choosing their center. Center #1: Students finish the ta and ti-ti dabbing worksheet in this freebie, using dabbing markers. Center #2: Students throw a squishy ball at the SMART board and read the patterns, like in this game. Center #3: Students compose patterns with this "We are dancing" freebie. Center #4: Students use popsicle sticks like in this blog post and dictate rhythms for known songs/chants or compose rhythm patterns. I hope this helps as you try something new in. your music room, and that your students enjoy it as much as mine do! Happy teaching!